The Converse Blog: The Converse Blog's Weapon Wednesday: The Goods. The NBA Playoffs are in full swing. Everyone seems to be salivating for a Lakers vs Celtics Final. If this does end up being the finals match up then I would love to see a full run of what I have pictured below. Larry Bird's Black and White vs Magic's Purple and Gold. I am not going to say much today, I really just wanted to post the pictures and let you enjoy them. They could even run the old commercial again, which I guess they would need permission from Magic and Bird. 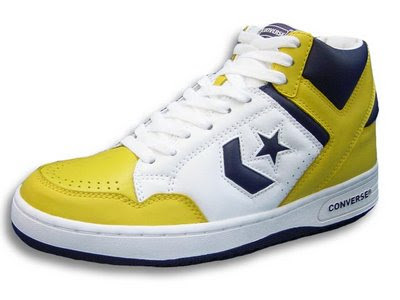 Either way, it is because of these shoes and who wore them that (nearly) every Wednesday is Weapon Wednesday here at the Converse Blog. Just take a minute to stare at them and let them marinate in your mind. really cool weapons i saw these other weapons x allstar in the same colorways they are pretty cool. but I cant find where to buy them in the states. 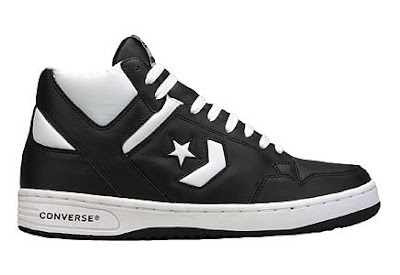 Any clue where I can find a pair of the black converse weapon? been looking for while and I keep coming up empty. Sadly, I would say eBay is your best bet right now.